FE ASTRONOMY = Mike Cavanaugh, President and Chairman of FECORE, Inc.
1) The launch video, played at the conference, claims that "FECORE is a non profit organization." 2) The FECORE website states "FE Core is established as a tax exempt non profit organization under the U.S. Code 501(c)(3) Internal Revenue Service regulations...."
- "FECORE is a non-profit...."
6) It appears that, according to his own statement, the documents I requested and which Publication 4221 enjoins him to provide, are not available because they are not presently in compliance with the law; i.e., they are not an approved 501(c)(3) organization if his own words are to be believed. - the exemption ruling letter issued by the IRS. An application is nothing more than an application, and the Publication is clear that he must provide a copy of Form 1023 submitted to the IRS, and "all documents submitted with Form 1023," if requested. I asked him if he has filed the application, saying, "Have you filed the paperwork with the IRS," and he has refused to answer. 10) The public has the right, NOW, to see the Form 1023 application, AND, "all documents submitted with Form 1023." Mike Cavanaugh refuses to comply. 11) Mike Cavanaugh cannot delete my comments under this thread, nor can he hide the fact that I have requested, in no less than 3 locations (i.e., his channel, Flat Earth Reset's channel, and now this forum), documents pursuant to Publication 4221 that he is obligated to provide. I will provide a link to this thread under Mr. Cavanaugh's own launch video at his channel, FE ASTRONOMY, and he may of his own volition prove FECORE Inc. to be a transparent non profit organization by uploading the requested documents here at his leisure. So Mr. Cavanaugh is claiming "foundation" status. That's fine, and as another gentleman has pointed out, "Your organization must comply with other tax law requirements applicable to section 501(c)(3) tax-exempt organizations. See Publication 4221-PF, Compliance Guide for 501(c)(3) Private Foundations, for more information." Much to Mr. Cavanaugh's chagrin, "Before Exempt Status is Recognized," is a plainly worded explanation that FECORE Inc. cannot refuse to provide the requested documents for public viewing based on his wish to avoid complying with the law. Again, Mr. Cavanaugh, you "must comply with other tax law requirements applicable to section 501(c)(3) tax-exempt organizations" BEFORE exempt status is recognized. Mr. Cavanaugh, you certainly expect membership/gift proceeds to immediately begin based on folks believing you to be a legitimate 501(c)(3) entity which affords gift-givers the tax deduction associated with such, and you have provided a PayPal link allowing for contributions NOW, therefore you must comply with the requirement to provide Form 1023 and "all documents submitted with Form 1023." Please provide those documents in a timely manner. Finally, Mr. Cavanaugh, I would like to see a copy of FECORE'S Articles of Incorporation since you have that now, are in fact operating as a legal "foundation," and are accepting gifts via PayPal based on that Incorporation. Taking it straight to them - I like it. Deleting your comments makes the shilliness even more obvious. Good work Mark, all these people see flat earth for is money, money, money. The FECORE non-profit was disclosed at Shillfest 2017.
no where on the website are the words "Flat Earth"
2017 Chamber Board Members: Pam Craft (Co-President), Sara Williams (Co-President), Bonnie Luczyk (Vice President) Stephon Wasio (Treasurer), Deb Palguta (Secretary), Tom Fair, Mary Klinedinst, Diane Annis, Julie Whitmer, Tom England, Gene Patrick, and Kerry Knape. THOMAS ENGLAND, 608 W MAPLE AVE, besides the UNIQUE-TOOLING.COM domain name, is the "Company Agent" for Shamrock LLC. Thanks, csp. Yes, we have a Mennonite church, Shamrock LLC, Mike Cavanaugh, Thomas England, and several addresses in a tiny town all seemingly conjoined in this FECORE thing. If everything is on the up and up, why wouldn't the President and Chairman have just said-- sure, I'll get that 501(c)(3) application paperwork we submitted to the IRS for you to look at. They are operating as a 501(c)(3), accepting donations through PayPal, and there should be no hesitation to show they are above board. As an aside, you guys may have noticed that the FECORE launch video screamed Dr. Zack, in my estimation. The time-lapse drawings in the video is a style that Dr. Zack has used in his own videos. My guess (just a guess) is that he, or an associate who does his videos, was the one who did the FECORE launch video. Notice the shamrock leaf in the logo and the video on the homepage. Are the same dark blue "Unique Tooling" vans (parked around the corner/out the back). Mike Cavanaugh: "The organisation working on our 501c3 is Foundation group in Nashville TN. 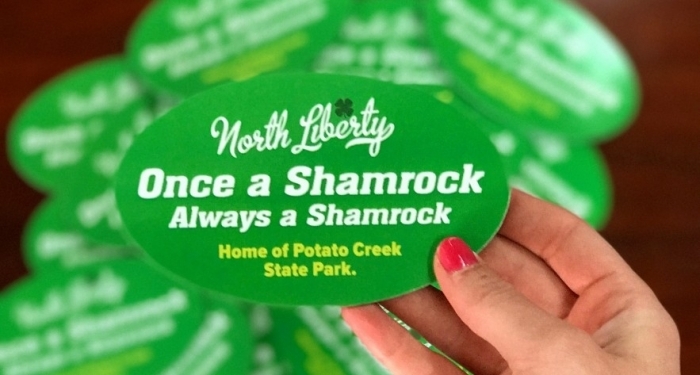 Good luck with your witch hunt...."
North Liberty, Indiana, also known as the "Gateway to Potato Creek"
"Once a Shamrock always a Shamrock." I believe this is making connections where connections are not present. This is a LLC setup by THOMAS ENGLAND in JAN 2012. Roy E. Disney's Shamrock Holdings was founded in 1978 and operates out of CA. A shamrock is a young sprig of clover, used as a symbol of Ireland. Unless someone can create a credible connection, I believe this is FUD. To me it appears like THOMAS ENGLAND, who is part of UNIQUE TOOLING and SHAMROCK HOLDINGS LLC is helping incorporate and setup FECORE as a non profit. Agree with you, csp, about the Shamrock LLC, Disney connection. I had made a similar comment over at Flat Earth Reset's page. Kudos to those guys for their efforts in this. I thought I'd let the below names marinate here a little bit just in case any connections are made by others viewing this thread (Bold names are in both lists). Just a few comments; Jeran Campanella seems to be the newest member of "Your Team," since his name wasn't listed in the 9/9/17 video. I assume the names of "Our Staff" are all given birth names. A couple obvious nom de plume's stand out; at a minimum, "Dr. Zack," (EDIT 11/20/17, POSSIBLY, a Dr. Zack Kalarickal DDS, not a nom de plume after all. Maybe my mistake, see http://tinyurl.com/y9lvk6fy --EDIT 11/22/17, the DDS is not the Dr. Zack on YouTube. See/hear the DDS in this video, http://tinyurl.com/y72bozct) and "Pilot Lx." Personally, I wouldn't think a "non-profit" (wink, wink) organization would want nom de plume's listed as "membership," but that's just me. It might be interesting to know how many of the listed names could be accused of shillish, un-flat-earthly behavior. Because other than the Globebuster's crew and Dr. Zack, I personally am not familiar with any of the others, so far as any having a YouTube presence or being known as a flat earther. But then I didn't have a clue about Mike Cavanaugh's channel either, until the other day at Flat Earth Reset's channel when I had to ask him his name, since in comment threads he shows up as FE ASTRONOMY. conglomerate, noun, a number of different things or parts that are put or grouped together to form a whole but remain distinct entities: the Earth is a specialized conglomerate of organisms. 2) Which leaves open the (in my view, a slight) possibility there is a connection. The Hidden Hand likes to remain hidden. So I personally don't think the Mega would allow the minion (mom & pop) to use Mega's name, since Mega wants to remain completely hidden. A couple of the search engines show a Rick Hummer (FECORE staff member) association with North Liberty IN. Another pair of boots on the ground with the North Liberty Mennonite brethern, if the same individual. markwilson wrote: A couple of the search engines show a Rick Hummer (FECORE staff member) association with North Liberty IN. Member of the "FE Core" facebook group. Rick Hummer was born and raised in North Liberty, Indiana. He grew up minutes from Potato Creek State Park and has loved his experiences throughout his life time in Michiana. After attending John Glenn High School, he attended Butler University in Indianapolis. While at Butler, Hummer began his radio career as an intern at WZPL. Launching his career from there, he has hosted radio shows in South Bend, Fort Wayne, Riverside (CA), Los Angeles, San Diego, Myrtle Beach, and Charlotte before moving back to the Michiana area in 2002 to do a morning show and to be near his ailing father. Rick began his career in radio, television and film career in 1992. Hummer says, "I have lived in a lot of places, but Michiana (North Liberty) is always going to be called home." Rick Hummer is not a stranger to some viewers in the Michiana area. He once hosted afternoon drive at U93 and mornings at B100 & Pulse-fm. He was very active in the MDA/"Jerry's Kids" Telethons for many years with the staff at WSJV. Hummer is very community driven, has an uncanny ability to never meet a stranger and is strong in his faith of Jesus Christ. Hummer states, "It's amazing how Experience Michiana has become part of my life and I am looking forward to working alongside my friend, Kelly (Morgan). Having a great producer and staff, we will all be doing our best at delivering a product that truly encourages people to get out and Experience Michiana for themselves." He is apparently in Hungary and is the directory of a company called "Thermoflash"
Just spoke with Foundation Group, the outfit Cavanaugh says is doing the paperwork for them. Cavanaugh isn't even the primary contact, and Foundation Group won't provide information to anybody other than the primary. They refused to give any information other than Rick Hummer is the primary contact, not Mike Cavanaugh. She referred me to the IRS, Public Charities (877)829-5500, or the Secretary of State. I just talked to a Brian at the Secretary of State office. He could not find any variations of FECORE, FE CORE, Field Engineers Core, that we tried. Nothing. I even gave him both Hummer's and Cavanaugh's names. Nothing. https://inbiz.in.gov/BOS/Home/Index - "Search for a Business"
One thing he mentioned was that it's possible the "Foundation" could be listed under another name, which would immediately raise the question, why. The only other idea he had, since his office has no investigational authority, is to contact the State Attorney General, Consumer Protection office. Since all of us have access to the very same information database that Brian has, perhaps Mike Cavanaugh, or Rick Hummer, might extend to those of us considering donating to their charitable foundation (serious sarcasm intended), the information (different organization name, etc) needed to confirm they are a lawful charitable foundation in the State of Indiana (or whichever far flung state they have filed paperwork in for this flat earth juggernaut they have in motion). Looking at it, the search engine is comprehensive in scope, though I haven't had the chance yet to try and track down the legal entity "FECORE" (or sundry variations). Edit: I'm not even in the correct month, my mistake (comment about future date deleted). But at the very least we know that they had their Articles of Incorporation back so that they can await the approval of the IRS "as of october 17th 2017." And if the State of Indiana has no record of the foundation (that we can find thus far), how is it that they can forward phantom 501(c)(3) paperwork to the Internal Revenue Service to consider granting such status? That's a trick indeed! Cavanaugh says, "as soon as those [Articles of Incorporation] return...."
So we know he has claimed they have the Articles of Incorporation returned to them. Because now, says he, they "can accept donations without the approval of the IRS," and that "those approvals can last from 3 to 12 months..."
The Secretary of State's office can't find the Articles of Incorporation. I asked Mike Cavanaugh, under one of his comments at youtube, to come here and be open about the questions that have arisen regarding FE Core. Should he, and/or Rick Hummer, reply to my comment under that thread I'll post it here if they choose to not come here to discuss the issue openly. "Did FE Core Prove The Real Flat Earth Model?" Speaking of "Controlled Opposition," this isn't the same Rick Hummer, is it? The reason I ask is that I did a google search of "rick hummer youtube," and it returned some interesting results; one of them being the above video. Here's an arbitrarily paused screen capture from the video. Further, a Rick Hummer goes back quite some time pushing the "Jesus, repent" meme. There's a Rick Hummer with Rob Skiba video, for example. And as csp discovered above, "Rick began his career in radio, television and film career in 1992." Media, the same media used as a tool of deceit since its inception. And if this is the same guy who feigned being all choked up when bringing the Globebusters to the podium at Shillfest just after the FECORE launch video played, what do we say? Great work Mark, very interested to see the response (if any) from these FE Core folks. Also, that is most definitely the same Rick Hummer in the video posted, just compare it to his photo posted on the FE Core page, or the radio profile page. Seems like CONINTELPRO through and through to me.